Break it down, set it up. Move it here, it looks better there. In the busyness and excitement of our move, one important thing keeps appearing in the back of my mind. Aviana's Elves. As I stare at this house full of boxes, I know. I want to somehow, someway, make it happen. I can never let it go. Ever. I flash. We were them. They are us. They will experience some of their worst days this year. All the holiday happiness. The people smiling, drinking their steaming hot chai lattes, or whatever it might be. The others, driving around with trees tied to the tops of their cars. Many going through the holiday season as normal, while we were in the fight of our lives. I can't shake the feeling, nor can I shake these families. Never do I want to. From the back, to the sides, to the front - the shift in focus occurs while placing the contents of each box. With Aviana above, and us below - I begin to narrow in on what's most important to us as a family. Two places swirl my every thought. The families on hospice, and the ones at Tahoe Forest Hospital. More specifically, the ones in the Gene Upshaw Memorial Cancer Center. Both, near and dear to our hearts. The friends we carry along from hospice mean everything to us. I hold the people who work in this field in the highest. Having recently been a family on hospice, we now understand what it feels like to be in that final chapter - the love, the care... all the while knowing where it leads. There's nothing more I want than to wrap these families in my arms and never let them go, so much so, my plan is to volunteer for hospice and possibly go back for my master's - but for now - my wish is to provide them with an amazing care package over the holidays. My hope is to let them know someone is thinking of them. I'm not sure if the Gene Upshaw Memorial Cancer Center sounds familiar, but a long time ago I posted, because Dave provided the engineering so this is definitely a full circle moment. I picture these people, but more specifically, people like my friend Cameo's sister, Trina, going in during the holidays for infusions. I can't even begin to imagine what that must feel like, or the domino effect it must have on the entire family. I would love to also give them a sliver of love - some kindness - anything to let them know we are thinking of them during their time of need. Many times throughout this past year, some are afraid to say Aviana's name, but others are upfront in asking how to honor her, especially on our upcoming one year anniversary. I know grief is specific to each individual, but for us - we never want to stop hearing Aviana's name. If I could skywrite her name - I would. We think of her all day, every day. We not only welcome any talk about her, but it makes my soul sing. It keeps her memory alive, and from two parents who've lost their girl, all we truly care about in this life is keeping her as alive as possible. We might cry, but it's okay. I cry all the time over her. I think of it as a good thing. I tell people, just as I laugh and feel happiness over her, I'm good with feeling the pain too. I would rather feel pain, than nothing at all. The pain keeps her just as close to me as any other emotion. As far as how to honor our girl - I always say however makes you feel best! Whatever you saw in her, is what she would probably want put back into the world! More often than not, people want more specific ways of honoring her ; ) So if you're still wondering - we would love nothing more on this upcoming one year anniversary than to provide our local families on hospice, and at Tahoe Forest Hospital with as many care packages as our hands can handle! If you would like to join in our efforts, we would appreciate the love! 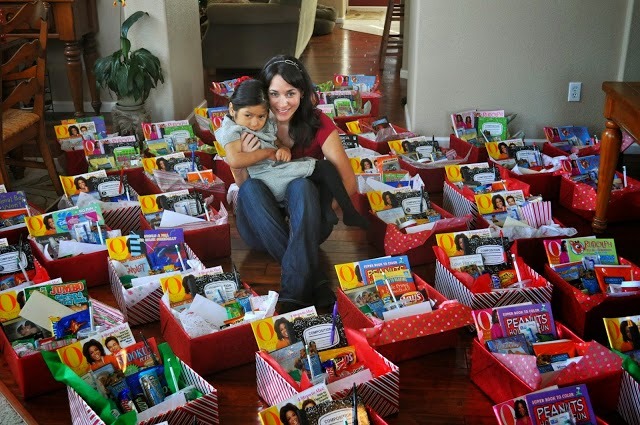 You can donate magazines, inspirational quote books, movies, unscented anti-bacterial soaps and lotions, cards, etc. If you choose to help in this way, I hope you don't mind me asking that all of these items are new. You can also make a cash donation and I will put it towards the purchase of the above items or anything else we think might be of comfort. I appreciate your consideration in helping us once again! We have been shown so much kindness over the many years. We're always amazed when someone goes out of their way to think of us. We vow to keep this going year after year, as it's simply the most gratifying way of giving back to families who might be going through one of the worst times of their lives. We are planning on starting deliveries around the middle of December! First of all, you fixed it and all the pictures are back. I'm so happy to see this post because if gives me the direction I needed. I'm glad it's Dave's hospital, too. I am so EXCITED about this!! I will of course make a donation but if you need any extra hands packing, loading, or delivering packages you know where to find me. I LOVE the pictures of your new house. Looks like a perfect fit. I adored your previous post. What a perfectly beautiful way to honor Avi and Kama. Love you both glad your getting settled. Sarah ~ Both you and Dixie have new names! I was so confused ; ) I like! Thank you so much for your love support, and offers of help every which way! I miss you and hope you are doing well. That's my original Google ID when I was still doing fostercare and for some cosmic reason, it popped up here when your pictures popped up. I thought about you all day on Friday and Saturday and then had a senior moment on Sunday. I hope you two had a day full of memories...of course you did! So I have a question - if you have senior moments, what's my malfunction junction ; ) Ha Ha! My mom and Gary came up to visit. It was a beautiful day - relaxing and nice in every way. Yay, the elves live on another year!! Thinking of you yesterday and today <3 I don't know what to write except that I am sending prayers, thoughts, and virtual hugs your way. I think of ya'll very often. I wish transporters like on Star Trek were real so I could spend this afternoon with you & Rainey in Tahoe and just sit and talk. Love you! Yay, so happy to hear the Elves will be busy this year. Wish I was closer, I would come help. I think of you often. Thank you so much for being right along side us every year. I too wish you were here with us. Not necessarily to help, (even though it's such a labor of love), but so I could meet you!! I would love to meet you!! To know you! I wish I could meet you as well, someday hopefully our paths will cross. I too would love to meet you. I love the four trees representing you, Dave, Mom and Gary watching over your girls. I forgot how big the pine cones are out there, ours here in Indiana are typically about 1/2 that size. Hope the elves are getting lots of good stuff rolling in. If you need something let me know.